Yesterday was fairly sunny, as winter days in Wellington go, and I found myself on a fairly miscellaneous wander through parts of Belmont Regional Park and (eventually) Lower Hutt. road at the Kelson entrance. I thought I might catch a train out to the Dry Creek entrance to Belmont Regional Park (most easily accessible from Manor Park Railway Station), and see where I ended up. It wasn’t until after I’d bought my day-rover ticket that I remembered many commuter trains in Wellington are being replaced by buses right now, at least on weekends, while they’re continuing various line upgrades. So I hopped on the Rail Replacement bus to find that due to various road layout issues, it wasn’t going to stop at Manor Park railway station. Instead it’d drop me at Silverstream (the next station along) and I’d then have to look for a “dinky little purple bus” to get back to Manor Park. It turns out the dinky little purple bus wasn’t very well synchronised with the other buses, and the person driving it had never been to Manor Park Railway Station before. Myself and the other poor guy on that bus eventually ended up in the right place, well over an hour after the train-bus had left Wellington. Looking up towards Boulder Hill. By now I was thinking there was no way I wanted to get back home the same way, so and made plans to get over to Paremata, on the far side of the park. This would mean walking up to Boulder Hill. Boulder Hill is a local high point from the Dry Creek entrance of Belmont Regional Park, and quite a nice walk. Having left the entrance some time after 12 (I’d had a late start even before the late train-bus), getting up at a reasonable pace, necessary if I was going to get all the way over the park before dark, took about an hour. Near the top I ran into some people coming the other way, who told me they couldn’t go any further because the park had been closed off. 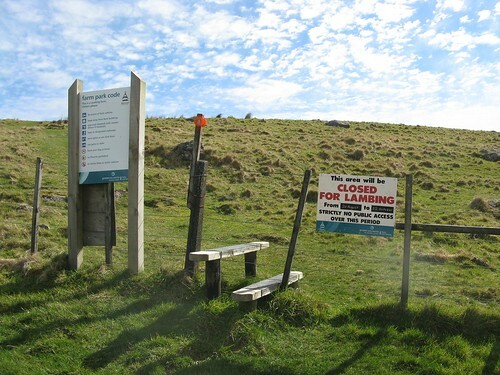 Sure enough, a couple of hundred metres further on and just below the top, there was a big sign on the fence saying the area was closed for lambing between 20th August and 22nd October. So I’d missed out on getting past that fence by a couple of days. Maybe I should have phoned the Wellington Regional Council before I left to check on track status, but I still felt a bit let down that there was no indication at the entrance (full of signposts and descriptions about the Boulder Hill walk) that it was not actually legally possible to get to Boulder Hill, and consequently not possible to get past it. I turns out, as I eventually figured out discovered, that when Boulder Hill is cut off for lambing season, that entire corner of Belmont Regional Park is cut off. The only ways down are either back to Dry Creek and that horribly inconvenient railway station, or down a side track to Kelson. That’s where I went since I didn’t want to go back to where I came, and I’d not been that way before. I made a point to tell everyone I met on the way down that they weren’t going to be able to get the whole way up, so more or less became a spreader of disappointment. 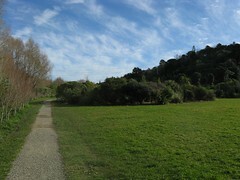 The “Kelson” entrance to Belmont Regional Park is near the end of a very long road which is full of the kinds of properties people have when land is more available. The main feature from a walking perspective is that it takes a long time to walk anywhere, but the road eventually dropped me on the busy State Highway 2. Fortuitously there was an okay footpath that let’s one skim the edge of the steep hillside without getting too close to the traffic, and I was eventually able to cross the main road at some traffic lights, finally making it to the Hutt River. provides brief access to the actual river. I don’t really enjoy walking around the Hutt Valley so much. It tends to be made up of very long north-south roads (just full of house after house if you’re walking along a road like that), and there are features such as the river that runs the length of the valley, and the railway line, that make it difficult to criss-cross between these long north-south roads. 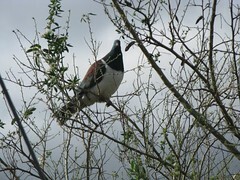 The Hutt River’s nice in places. 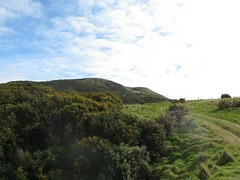 A walk called the Hutt River Trail follows both sides of it. A year or so ago, Stacey and I walked part of this trail, mostly on the true left (eastern) side of the river. It was a bit of a let down, I think because we went in with expectations that a river trail might actually spend a lot of time following alongside a river. The trail on both sides tends to either be up near the roads, or down in the wide grassy flood-regions inside the stop-banks. In both cases, any views over the actual river are nearly always blocked by the bank of trees grown alongside. This is by design, because every few years the Hutt River tends to flood with a massive rain event. The entire Hutt Valley has been carved out by this river that has its most significant origins out of the Tararua Range, but more widely out of the Akatarawas and the Rimutaka Range. Flooding is a natural event given enough time. As with any river, flooding is a standard way in which the water changes course and keeps chiselling into the valley floor, which over time has resulted in the wide valley we see today. 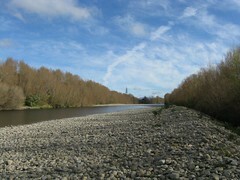 The Hutt River hasn’t been a wild river since the area was settled, however. Now that so much infrastructure has been built and now that the valley’s floor has been carefully subdivided into people’s private property, the Hutt River will never be allowed to be a wild river again. For the foreseeable future, the riverhas to keep flowing in the same line as at that geologically instantaneous moment when people settled the area, most definitively in the 1930s when the government decided to build lots of state housing. The river’s most significant recent movement was during Wellington’s major earthquake in 1855. 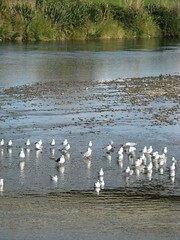 There’s an ongoing programme with the Hutt City Council to manage the flow of the river. Aside from regular removal of old refrigerators, shopping trolleys and who-knows what else that people dump from time to time, the council ensures that any discretions the river might have from its acceptable course are quickly shut down, and it’s put back in its place. There’s really very little choice now, given how things have developed. Its course has to be controlled. Every so often these kinds of rivers still burst their banks, however, and everyone wonders whose fault it is that properties that were subdivided just a few metres above its regular high points are suddenly flooded, and who’s going to pay for it. Recently we went and looked through an open home whose back door looks straight through to the river just 200 metres away, and it’s a flat and unobscured line. It shouldn’t be surprising that such kinds of problems occur. I followed the Hutt River trail for a while, which is a nice walk albeit long and parallel, eventually bailing out at Ava Railway Station. It was some time before 4pm by now, and soon after I walked under a railway bridge, a train clattered past behind me towards Upper Hutt — a sign that the day’s maintenance was finished and the trains were finally running again. This prompted me to run back to Ava, at which point the Rail Replacement bus pulled into the parking area, saw me standing on the platform, and promptly drove away. No matter. There was still a little time before I needed to head home, and I really wanted to get a train and make some decent use of my Day Rover ticket. I hopped on the first train that came along, which turned out to be heading the opposite direction towards Upper Hutt, and sat on it all the way to Taita before jumping off and switching to the other side of the platform, finally finding a train home. Fun. This entry was posted in daywalk and tagged belmont regional park, daywalk, suburbia. Bookmark the permalink.